The XD-2i explosives trace detector will detect every threat explosive on current Government and Military requirements list, regardless of operational environment, presence of other substances, or condition of surfaces to be analyzed. Requiring no warm-up time, no calibration, no clear-down after detection, and minimal training, this explosives detection system will detect invisible explosives residue (trace) and can analyze visible (bulk) samples too. The XD-2i is being deployed to help interdict explosives and explosive devices and those who manufacture, assemble, store, transport, and emplace IEDs. 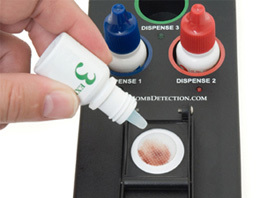 Utilizing explosives detection chemistry and a precise heat / time profile, the XD-2i explosives detector can quickly detect and enable users to identify commercial, military, and homemade (HME) explosives without creating false positives on common confusants, interferents, and masking agents. Analysis time ranges from instant to approximately 30 seconds, time varying with explosives detected. The XD-2i has been extensively tested by United States Government and Military laboratories and has been deployed with military EOD units, civilian (fire and police) bomb squads, post blast investigators, K9 teams, and first responders throughout the United States and abroad. To best serve the user community, enhancements to the system and supporting training aids are perpetual. Test reports along with customer references are available to recognized Government and Military entities. This explosives detector weighs less than 2 pounds, has no export restrictions, and is powered by eight (8) AA batteries, an AC power adaptor, or DC cigarette lighter adaptor. References Available upon request. 300 Swipes Extended service contracts, training, solution replacement kits, and other accessories sold separately. All Federal agencies and military customers qualify for discounted GSA pricing. State, city, and local agencies may qualify for discounts by coordinating through GSA’s Disaster Recovery and 1122 Programs. © 2019 American Innovations, Inc.